Desktop search has looked like it was fading into the dust since the last quarter of 2016. The big announcement by Google that they’d prioritize their mobile index seemed to sound a killing blow for desktop devices. And global smartphone sales were expected to hit 1.5B units in 2016. That’s a lot of smartphones – and a lot of prospective mobile searches. But is it fair to discount desktop search altogether? Read on to find out why it’s still worth including such searches in your strategy. Do users still use desktop search? It might sound obvious, but users have different needs with different devices. For smartphones, 90% of user time is actually spent in apps. So that’s users playing games, using social media, checking email, and using media like music and video. You’ve already guessed that most of that usage happens in the morning or the evening. Commuters need something to do during their travel time and their smartphone gives them that. So mobile usage expands to fit the available technology. But turning data into sights hits a problem when it comes to Millennials. Yes, there have been year-on-year drops in desktop usage by this generation. But Millennials don’t only use their mobile devices. Many consider themselves to be multi-platform users. And they may have dispensed with a desktop computer at home, but they’ll still work on one. That applies to a lot of mobile users, regardless of their age demographic. 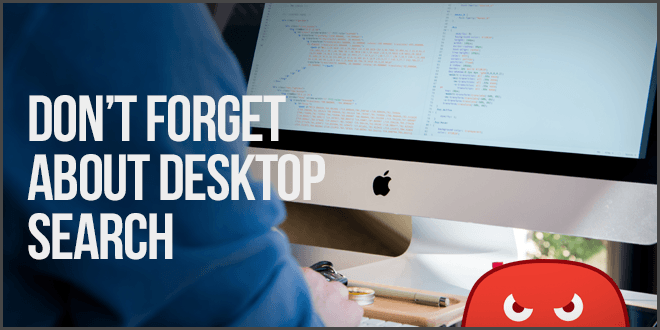 Whether they work from home, or commute to an office, they’re still working on a desktop device. Just like they did before the smartphone boom. And according to eMarketer, 80% of conversions are still taking place on desktops. Purchases for devices like computers and associated hardware even convert at 94% on desktop. The crossover happens for lower priced items that don’t require as much decision making. So flowers, toys, or video games all convert better on mobile. So why do some searches work better on desktop? When you’re buying an item like a computer, you’re essentially making an investment. So you’ll shop around before you buy. You’ll compare prices across websites. And you’ll sift through product reviews and forums seeking advice. That’s so much easier to do using a desktop search than it is on a mobile device. Multiple tabs are quicker to manage in a desktop browser. But if you’re ordering flowers for your partner? You don’t need to compare prices. You just need to choose the bouquet and tap “Checkout”. So even if the computer purchase still has a one-click “buy” function through e-Commerce, you still need data to help make your decision first. But there could be another reason for the higher desktop conversion rates. And the technology itself might be part of it. Users have experience in making purchases on a desktop device. No matter the website or platform, the process is often the same. But because different platforms use different payment systems, that can be more problematic on mobile. It’s straightforward enough if all vendors offer a PayPal payment option. But not all vendors do. And not all users have a PayPal account. They don’t necessarily want to reach for their credit card every time they want to make a purchase on their smartphone. So you can still target those users when they log onto a desktop device to make their high ticket purchases. Users understand security for desktop search. And a lot of users have firewalls and anti-virus protection installed that covers their use of search engines. They feel a lot more secure in making payments online. And users have experience in giving their personal information to websites on desktop in order to make a purchase. It’s often the same personal information they’d hand over in store. But mobile apps can often demand an excessive level of access to personal information. They don’t just want your address, zip code, and credit card number. They also want to check which other websites you’ve visited. Or they might log which physical locations you’ve been to. Almost 50% of mobile users have refused to install apps because of such demands. So a company may create a branded app to get around the problem of repeatedly entering credit card details. But that only solves the problem if a user agrees to install the app. Your website still needs to be mobile-responsive. And it’s a good idea to work on increasing its speed. That’s a must for users whether they’re using a mobile device or a desktop. But you don’t just want to focus on one index when you’re designing a strategy. The two indexes complement each other, so your strategy should encompass both. And SEO will need to pay more attention to the user journey as a whole. You’ll need to create campaigns that suit each device and what the user actually uses them for. Keep an eye on your data. Do your visitors spend more time watching your video content on mobile, but more time reading your long form content on desktop? Use that data to inform what you do next. Go back through your old blog posts and re-optimize them to work on either platform. Remember that, in a lot of ways, mobile devices are the preferred place to consume media. But desktop search can give a more immersive experience for browsing. Not only that, but Google’s crackdown on intrusive interstitials currently only applies to mobile devices. So there’s very little stopping marketers continuing to use welcome mats on desktop websites. We should also make a distinction here. Desktop doesn’t just mean a traditional desktop setup. It can also include laptop browsing. And with prices for laptops more affordable than ever, younger users are still buying them. That makes the ability to desktop search just as widespread as it was before. So the key thing to take away from the mobile vs. desktop search issue is not to panic. And stay tuned to The HOTH. We will keep you up to date with any new updates about changes to desktop search. I get frustrated sometimes because everyone is so focused on mobile optimization today that some websites are beginning to lag when it comes to their desktop versions! Both are still equally important.